Sally Stewart and Peggy Brown met at Kitchener Park playground in 1936. Sally had just moved into a new house, right across the street from Kitchener Playground run by the local Gyro Club—the name drawn from the word gyroscope, symbolizing the ability to maintain a desired course and attitude regardless of outside influences—at 114 Street and 103 Avenue. It was the beginning of a lifelong friendship that began in the third grade and holds strong after more than 70 years. Urban playgrounds are universal, but the story of Edmonton’s is unusual: a private group, the Gyro Club, started playgrounds and ran them for decades before the City got in the game. In an effort to promote civic life, the Gyro Club invested upwards of $15 000 in operating expenses and $20 000 in equipment and buildings. Today’s Giovanni Caboto Park began as “Gyro #1” in Patricia Park in 1922, then came Kitchener Park in Oliver, and Tipton Park near Whyte Avenue. It was the beginning of the Gyro playground legacy that still serves the people of Edmonton, especially its children. The Gyro playgrounds brought children together. This was their world. In fact, children walked to playgrounds in their own neighbourhoods—McCauley, Oliver, and Queen Alexandra—and came together from both sides of the North Saskatchewan River to compete in annual Inter-Playground tournaments. 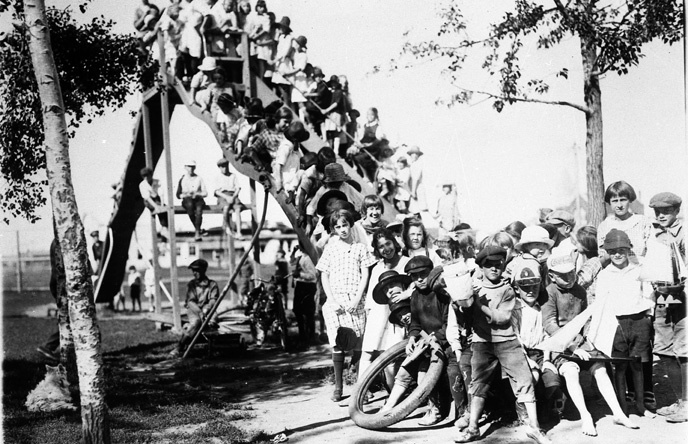 Once a season Gyro playgrounds staged a Children’s Circus with a street parade at each site. The Edmonton children experienced not only arts and crafts, make believe, storytelling, reading, wading pools and sport activities at Gyro playgrounds, but also formed bonds of friendship. This was a time for free range kids who roamed around their neighbourhood streets, playgrounds, natural areas, and the river valley. Sometimes they got into trouble but most of the time they got into fun and learned to make the city their own. Playgrounds are places where meeting and making friends is important to the lives of children in their own neighbourhoods and communities. Children create an identity for a place there as part of daily life. Children’s own experiences with such special spaces in their world construct a sense of place as neighbourhood and home in the city. Summer has arrived and so has the happy children sliding down chutes, riding the “ocean wave,” enjoying themselves in the Gyro playgrounds. PearlAnn Reichwein is an Associate Professor, Physical Education and Recreation, at the University of Alberta. Paulina Retamales holds Masters degree in Recreation and Leisure Studies from the University of Alberta.